The grass is gradually turning brown and the leaves are starting to change colors and fall from the trees. It's definitely autumn in the Twin Cities. Before you put away your lawn tools and resign yourself to the snow that you know is coming, consider that now is actually the best time of year to improve the health and appearance of your lawn. A sure-fire way to do that is to fertilize your lawn and kill all remaining weeds. In the early spring, weeds like the dandelion and creeping Charlie grow at an extremely fast rate. It's all you can do to stay one step ahead of them. By fall, weed growth comes to a standstill as they prepare for winter by pulling nutrients into themselves. This is the ideal time to apply targeted weed killers. It typically only requires one application to kill dandelions at this time of year. You may need to be more persistent with the creeping Charlie. Plan to use a herbicide that contains triploycr and make sure that the bag specifies the use for the product. It should specifically state that it kills creeping Charlie plants or the Latin name of the plant, glechoma hederacea. You can apply the first application any time in September and then try again if the weeds aren't completely gone within two weeks. September is the best month of the year to fertilize your lawn because the effects last until next spring when the snow thaws. If you wait until spring to fertilize, you run the risk of causing undue stress on the lawn. That is because the fertilization process encourages the fast growth of green grass to coincide with summer dryness, which in turn can cause lawn disease. When selecting a fertilizer, pay attention to the N, P, and K numbers. These stand for nitrogen, phosphorus, and potassium. This shows the percentage of each ingredient in comparison to filler material. We also recommend going with a slow-release fertilizer to extend the amount of time required before you need to fertilize again. Need Help Selecting Materials or Getting the Chores Done? 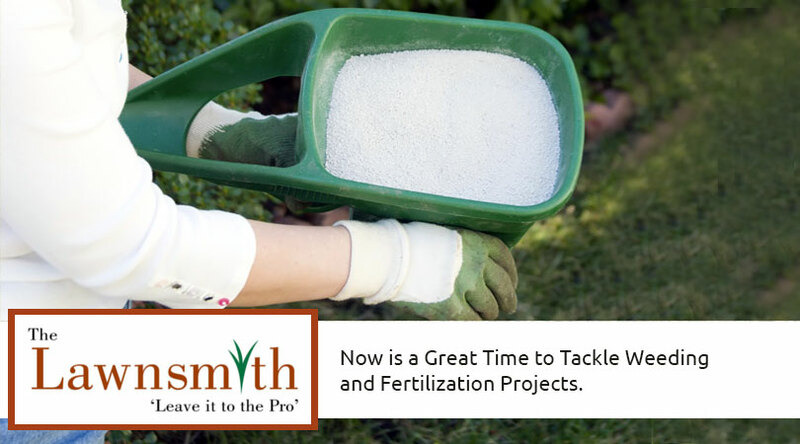 The Lawnsmith understands that knowing which type of fertilizer or herbicide to buy doesn't come naturally to all homeowners. You also may not have the time or desire to tackle weeding and lawn fertilization. Whatever your situation, remember that we're here to help at any time of the year.